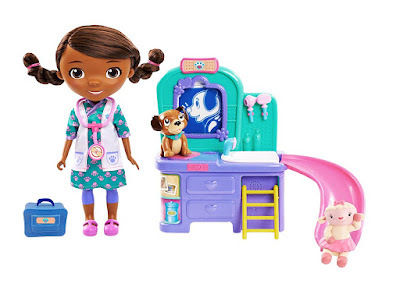 Amazon Prime Members - HURRY over to get this Doc McStuffins Pet Clinic Doll for ONLY $15.19 (Retail $44.99)! Additional savings will show at checkout. Now Doc can check all her pets with this new Pets n' Vet Doll. Doc will take LIGHT-UP X-rays, give her toys a bath or let them have some fun going down the slide. This set also includes FUN PHRASES AND SONG. Includes talking Doc Doll, Lambie, Findo, 3 tools and interactive Vet Station.